Apricot preserves are baked inside this moist coffee cake. After baking, the warm cake is spread with a cinnamon-coconut crumble and broiled until golden. Combine flour, baking powder and baking soda. Beat cream cheese, 1/2 cup butter and granulated sugar in large bowl with mixer until blended. Add eggs, 1 at a time, beating well after each addition. Blend in milk and vanilla. Gradually add flour mixture, beating well after each addition. Pour half the batter into 13x9-inch pan sprayed with cooking spray. Dot with preserves; cover with remaining batter. Bake 35 to 40 min. or until toothpick inserted in center comes out clean. Heat broiler. 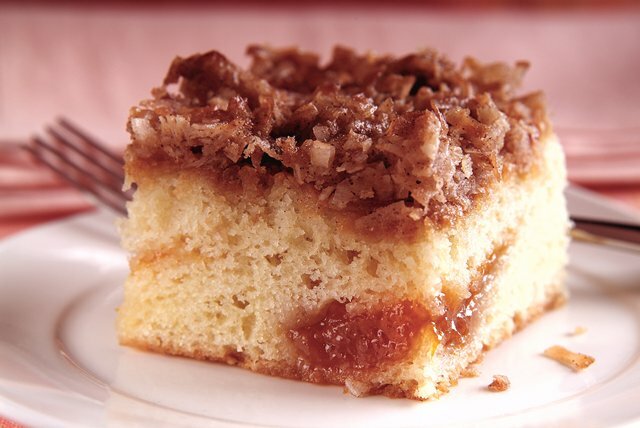 Combine coconut, brown sugar, 1/3 cup butter and cinnamon; sprinkle over warm cake. Broil, 4 inches from heat, 2 to 3 min. or until golden brown. Cool. Enjoy an afternoon treat with friends with a serving of this delicious cake along with a cup of hot brewed MAXWELL HOUSE Coffee. Prepare using your favorite flavor of fruit preserves, such as peach, pineapple, red raspberry or cherry. Substitute 2 cups cake flour for the 1-3/4 cups all-purpose flour.